This is one of several Lovecraft cover paintings he did. Right you are. I’ve actually got a couple of submissions in the lineup which use other bits from the very cover – should’ve consolidated the credits some. I was probably thrown off ’cause I believe the submitter actually scanned in his cover instead of finding a digital copy online. I was hoping someone would do this, though I was thinking more of .. “Ha-ha! 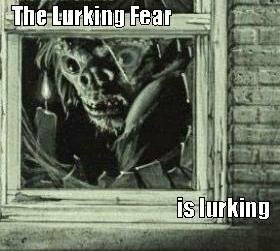 My fear iz lurkin’!” for the caption.